Lake Views at this 2 Bedroom Sandestin Town home with Golf Cart! Ease into vacation with lake and bay views + a whole lot of resort life (and a golf cart)! 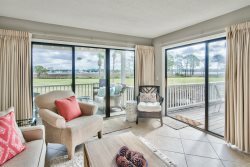 Vacation within minutes of all the Sandestin® Golf and Beach Resort resort life has to offer at this 2-bedroom, 3-bathroom town home located on its Lakeside. This charming town home located in Bayou Village is a unique retreat that’s quiet and packed with options for family fun. Surrounded by the 14th and 17th fairways of The Links Golf Club and with views of the community lake and the Choctawhatchee Bay you’ll enjoy waking up surrounded by quiet beauty. Each morning, enjoy a little you-time on the screened porch (a must in Florida!). From the porch you can walk the lake or even try your hand at enticing a nibble from the lake. After you’ve eased into your vacation day, hop on the complementary golf cart and get ready to experience all that resort lifestyle has to offer. On the Sandestin® Golf and Beach Resort you’ll have access to two community pools, The Village of Baytowne Wharf, the Baytowne Marina, four golf courses, a tennis center and – what could we be forgetting?! Oh! Only the most beautiful beaches along the southern coast boasting sugar-white beaches and emerald-green waters. Once you’ve spent your morning relaxing on the patio, taking a dip in one of two resort pools or touring gated grounds on your own golf cart, know that you’ll return home to comfort and relaxation! The first floor of this townhome offers an open concept floor plan with a living and dining room and kitchen. There is a bonus full bathroom on the first floor as well – perfect for a quick rinse after the pool or beach. The second floor is home to two bedrooms. The master bedroom has a king bed with a unique private sun room where the views continue. The en suite bathroom has a separate single vanity perfect for a little privacy. The master bathroom has shower/tub combo. The guest room has a queen bed and also has an en suite bathroom and separate vanity. A beautiful set-up for privacy and comfort! Just minutes from your door (and right across Horseshoe Bayou) is The Village of Baytowne Wharf where food and fun await! The Village has something that every member of your group, no matter their age, can enjoy. Get ready to ease into your vacation with days spent lounging on sugar-white sand or dipping in the pool – tough decisions!